Playtesters: Marty_Hale-Evans?, Ron_Hale-Evans?, AlphaTim Schutz, Eric_Yarnell,_ND? In addition to New_City?, IceFloe?, and San_Andreas?, there were a number of other games that I particularly liked for various reasons. Decay was the only purely abstract game and it is based on a tile placement/array system different from anything I've seen before. If you like abstracts and want to try something different, give it a try. Decay certainly was different, and it was meaty. Our game lasted almost two hours, and most of us were thinking hard throughout the game. However, we found it rather "fiddly" (to use a technical term) and wished the designers, Robert Mundschau and Matt Heistad, would streamline it in a future revision. 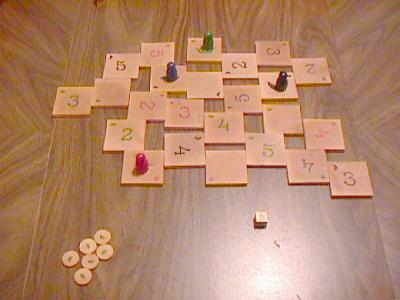 The players create a game board from the piecepack tiles. They pay coins to move their pawns, and to move tiles around to attack other players. 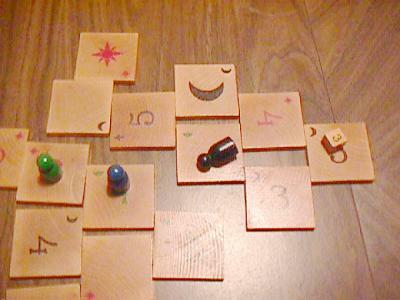 Attacks can steal coins from other players, or chop off sections of the board, making the game board smaller. If your pawn is on a board section that is removed, or you cannot move your pawn during your turn, then you are killed and removed from play. Last player remaining on the board wins! An imaginative idea for a game, yes? Unfortunately, some of the rules are so fiddly that not only did we have trouble remembering them, but apparently so did the authors. For example, the diagram illustrating Rule 1a, "You must place your tile in contact with at least one other tile already placed on the table" shows two piecepack tiles lying flush with each other. However, Rule 1c states, "You may not place a tile so that it completely shares one edge with the entire edge of another tile", and the illustration for that rule shows a counterexample that is nearly identical to the example for Rule 1a! Similarly, the rules for moving a tile state, "To be available for moving, the tile may not be touching other tiles on more than 2 adjacent sides", but one of the two counterexamples in the illustration shows a tile unavailable for moving that is only touching other tiles on two (opposite) sides. It seems clear that the authors had something definite in mind here, but had trouble expressing it. AlphaTim suggested that the next version of the game (if there is one) should drop all rules about adjacent sides, and simply state that a tile cannot be moved if it is touching other tiles on three or four sides. Much less fiddly. I suppose I am partly to blame for the confusion we experienced while playing Decay. We were working from three sets of rules: the official rules as entered in the Changing Landscapes contest, a player aid created by Mike Schoessow, and my own annotated copy of Mike's player aid. All three of these rulesets stated the rules slightly differently, and it wasn't always clear whether they contradicted one another. However, it certainly would have helped if the primary ruleset didn't contradict itself. I don't want you to think Decay wasn't fun. It was, or we would have quit well before we spent two hours on it. However, there are still a couple of negative things we noticed about the current version. One is the imprecision of movement of the tiles. Even on a relatively non-slippery table, the other tiles tend to shift around when you move one. The rules state "tiles may separate a fraction of an inch from each other. For the purposes of the game, they are still in contact. In other words, don't be a weenie!" In my opinion, any game that needs to incorporate etiquette as part of the official rules (such as the injunction to "be cool" in Icehouse proper, another "positional" game with similar problems) has a basic flaw. Further on the imprecision issue, it's not always clear whether a tile you are moving will fit into a new location on the board without trying it -- and thereby jostling the board. The Heisenberg Uncertainty Principle at work! Perhaps the name "Decay" refers to the decay of subatomic particles? Marty was also hoist by her own petard. She was the first to remove a tile and split off part of the board. The smaller part, which contained my Ace (an important tile because Aces are unassailable), was discarded, and the board shrank. However, she was caught in an outlying area of the board, which Tim and I cooperated to isolate and split off. 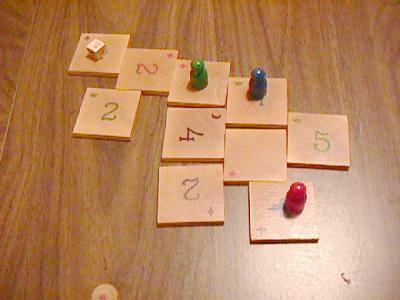 Marty's "island" was discarded and Marty was the first player to be eliminated from the game. (See the photos below.) It is important to stay as close to the center of the Decay board as you can, all else being equal. 1. The black pawn (Marty), realising it is on a doomed island, swoons melodramatically. 2. Now the board is smaller! Tim and I repeatedly robbed Eric until he had no coins and couldn't move his pawn at all. Eric was therefore eliminated second. I ended up with the greater part of the "money". Tim and I then took turns shrinking the board until there were only three tiles left. We agreed to a draw because each of us could always move from his current tile to the one empty tile (pawns cannot share tiles), and neither of us could use any of the tiles to attack the other and rob him until he was paralyzed. Eric suggested I should shout "What is the tiebreaker?" as I have been known to do when tied for first place, but it wouldn't have helped; there isn't one. Marty suggested that the tied player with the most coins should be the winner, since theoretically he has the most freedom of action. In any case, while the rules state that draws are rare, we encountered one in our first game. Elsewhere in the room they were playing BANG! ?, but our game ended with a fizzle. Still, it was exciting up until the very end; Marty and Eric stayed to watch the rest of the game, even though they could have played something else. The consensus was that although Decay has a lot of potential, it's kludgy. To sum up, Eric quoted James Ernest of CheapassGames again: "Too much clay". I'd like to play Decay again (would I have devoted this much space to it if I didn't enjoy it? ), but I think I'll wait until the authors clean up the rules. Actually, I didn't have much fun at all playing Decay. I do think the movement rules are very clunky and difficult to use, partly because they have so many limitations that seem arbitrary and partly because it's so difficult to tell whether a potential move is actually legal. Because you can move tiles fractions of inches, and placement is very unstructured, it's difficult to really ascertain what's touching what where, especially if the tiles happen to drift apart even a tiny bit as they're being moved. Added to the confusion about what the rules actually were, it got very frustrating very fast. On top of this, I really didn't see the structure of the game clearly. I play a lot of games, and I'm used to playtesting games; usually, even if I don't play well or don't like a certain game, I can see what the designer was up to and how the game probably should be played. With Decay, it seemed a lot like someone decided to put together a bunch of limitations and see if anyone could find a way to move effectively anyway. Perhaps that's not fair, but it's my perception. The movement limitations were so byzantine, and there were so few ways to affect other players besides indirect movements, that it quickly became more frustrating than fun to devise some way to have any effect, never mind actually eliminating other players. If the rules could be clarified, I might try this again, but on first impression a thumbs-down from me.